Bossa Nova, a robotics company geared toward grocers and other sellers of related consumer products, announced today it has raised $29 million in new funding. The round was led by Cota Capital, with previous investors such as Intel Capital, Lucas Venture Group, and WRV Capital and new investors LG Electronics and China Walden Ventures participating. Bossa Nova now has raised a total of $70 million. 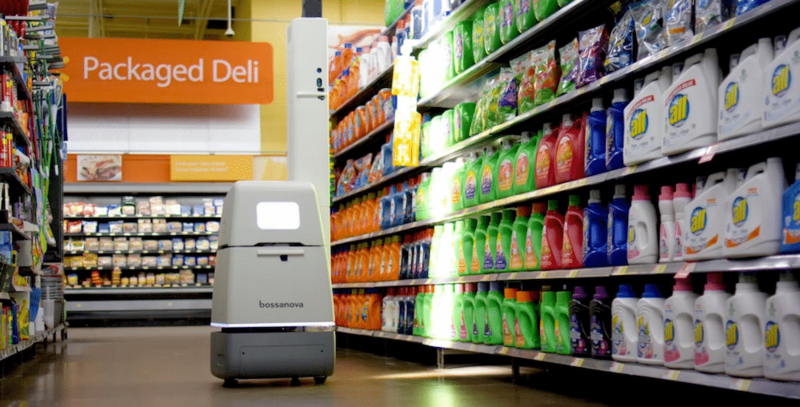 Bossa Nova, which is based in San Francisco and Pittsburgh, PA, makes an artificial intelligence-enhanced robot that uses a camera to surveil store shelves, taking note of which products need restocking, whether prices are accurate, and other inventory-related needs and actions. The company has had a number of pilots in major retail stores, including, most notably, the world’s largest, Walmart. Retailers currently struggle in maintaining an accurate inventory in real-time, something that costs them $1.1 trillion annually, according to IHL, a Tennessee firm that specializes in retail and hospitality research. “Retailers are interested in how they can improve operations at the store level; brands’ interest is related to merchandizing: where it’s placed, what’s it adjacent to,” says Martin Hitch, Bossa Nova’s chief business officer. That information is compared to what the robot actually does see, which is used to update a retailer’s inventory and alert human staff to problems that need to be fixed. The company also said it has a new partnership with California-based Flex, which will build the company’s robots and help Bossa Nova fulfill customer orders.